Circular dsDNA about 5 kb in size, associated with cellular histones in a chromatin-like complex. Encodes for 5-6 proteins. Transcription is nuclear, in two phases; early (replication), late (virion assembly/exit). 5-6 proteins are expressed from the two pre-MRNA by alternative splicing. 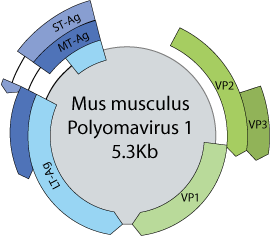 All genes are transcribed by host RNA pol II.